BILD offers full-service home remodeling to keep you safe and independent. The solutions here complete our list of services. Having the regions most highly trained accessibility specialists who are physical and occupational therapists ensures that you will find the best solutions to fit your needs. Our experienced tradesmen and designers help you to maintain a beautiful bathroom as well. We provide options to help you to achieve safety and independence while using only the highest quality products. Freedom in the kitchen is essential to being independent in the home. We can install automated shelving, resize your counter tops and remodel your entire kitchen. With our in-house interior designer, you can be assured of a beautiful kitchen that will increase the value of your home. Automatic door opener systems provide independent wheelchair access for homes or public places. Through the use of radio or infrared control devices, individuals can remotely control the opening or closing of the door. Door widening hinges are an easy way to gain a few inches of clearance for wheelchairs and floor lifts. Custom wood gates by Gatekeeper are high-end solutions to accent the decor of your home. The power vehicle rear mount lifts are designed to assist with easy loading of your wheelchair or scooter and numerous options can be customized for your needs. New dumbwaiter systems, unlike traditional versions, are simple to use and easy to maintain, with high quality material and requiring virtually no grease. 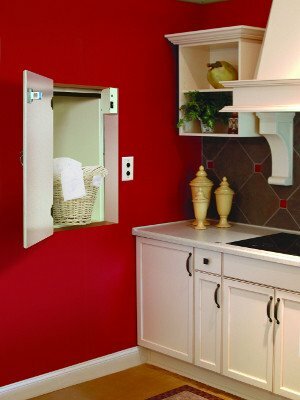 A dumbwaiter is perfect for those who need an extra set of hands around the house. Whether it’s moving laundry, meals or other day-to-day necessities from one floor to another, a dumbwaiter handles it all with ease. Sleep positioning systems provide support to keep the user’s body aligned throughout the night. For individuals who may be unable to position themselves, it is important to keep the body aligned in order to prevent physical deformities caused by poor posture in bed.